To Cite: Sedaghat S , Ebadi A, Rostami S , Fereidooni-Moghadam M. Development and Psychometric Evaluation of Cardiac Surgery Stressors Inventory: A Mixed Method Study in an Iranian Context, Iran Red Crescent Med J. 2019 ; 21(1):e83889. doi: 10.5812/ircmj.83889. Background: Open-heart surgery is a stressful, life-threatening experience inducing fear and anxiety in many patients and their families. Objectives: The present study was conducted to design an inventory assessing the stressors in open-heart surgery patients and evaluate its psychometric properties. Methods: This study was accomplished in two phases. The first phase involved a qualitative study during which in-depth interviews were carried out with 21 therapists and patients with a history of heart surgery. In addition, the primary items of the inventory were extracted by reviewing the literature and available questionnaires through a qualitative approach. In the second phase, the face, content, and construct validities of the inventory were investigated using the exploratory factor analysis with 360 participants. In addition, the reliability of the developed instrument was examined using Cronbach’s alpha and intraclass correlation coefficient (ICC). Results: Based on the findings obtained in the first phase, a pool of items was prepared. The findings of the exploratory factor analysis revealed a five-factor structure that explained 50.45% of the structural variance with a Kaiser-Meyer-Olkin value of 0.921 (P < 0.001). The first (12 items), second (13 items), third (seven items), fourth (eight items), and fifth (10 items) factors were named as “stressors in the intensive care unit”, “stressors related to the fear of uncertain future”, “internal stressors”, “stressors related to treatment team and facilities”, and “preoperative stressors”, respectively. The Cronbach’s alpha coefficient of the final version of the inventory, entailing 50 items, was obtained as 0.87. In addition, the ICC between the test and retest scores was estimated at 0.94. Conclusions: Given the fact that the meaning, concept, and factors associated with any phenomenon are influenced by sociocultural context and they vary from country to country, it is necessary to use a questionnaire designed based on the experiences and concepts expressed by the individuals living in the same context. According to the findings, the developed 50-item Cardiac Surgery Stressor Inventory is a simple, valid, and reliable tool for the measurement of stressors in open-heart surgery patients. Although open-heart surgery is a successful technical intervention in cardiac care, it is a stressful, life-threatening experience inducing fear and anxiety in many patients and their families (1, 2). Patients undergoing this surgery face numerous physical, psychological, and social stressors during this difficult period and suffer from a wide variety of concerns (3). These patients feel neglected, insecure, and afraid due to the receipt of and exposure to the highly technical care and ventilator support, readmission to the ICU, placement in a frustrating care setting, contact with busy nurses involved in daily tasks, lack of easy access to healthcare staff, personnel’s cold behavior, and negligence to their requests. Therefore, they assume that their integrity is at stake (4, 5). The management of stressors in patients with cardiac surgery may shorten the duration of hospital stay and positively affect the recovery process (6). Based on the evidence, the care interventions are probably based on the nurses’ perceptions of stressors rather than the patients’ perceptions. Accordingly, the nurses prioritize patient’s problems and carry out the planned care based on their perception of stressors (7). Lazarus emphasizes the identification of the perceptions of the group that has experienced stress. Regarding this, it is essential to develop and examine self-report methods that enable the patients to assess the severity of stressors. Therefore, the identification of the stressful incidents and situations from the perspective of cardiac patients allows the nurses to control these stressors and provide patient-specific care through nursing interventions (8). According to the literature, there are general and specific tools for investigating the stressors in patients. The Intensive Care Unit Environmental Stressor Scale (ICUESS) is a general tool used for all patients admitted to the internal and surgical intensive care units (9, 10). One of the specific instruments investigating stressors in heart patients is the Cardiac Surgery Stressors Scale (CSSS). This tool was developed by Carr and Powers (8) to measure the severity of stressors experienced by coronary artery bypass patients. This instrument was modified by White (11) in a quantitative study. In this regard, they designed the Revised Cardiac Surgery Stressors Scale (RCSSS) by taking six items from the ICUESS and adding them to the CSSS (11). The components of the abovementioned tools (i.e., ICUESS, CSSS, and RCSSS) have been derived from the review of the literature and views of the professionals working in the cardiovascular unit (8, 10, 11). However, these tools entail some limitations, as follows: (1) the three tools have acceptable levels of content validity (as confirmed by a panel of experts and review of the literature) and reliability (as indicated by Cronbach’s alpha coefficient and test-test method); however, they fail to have construct validity, (2) these tools are not based on the patient’s perceived experiences and real emotions, and (3) they are often designed based on the western culture, while cultural characteristics are among the factors influencing the individuals’ perception of stressors and way of responding to these factors (12). In this regard, a tool developed for a specific social or cultural group is not applicable to another culture (13). Iran is an Islamic country with its own culture, belief, and lifestyle. Given the fact that the meaning, concept, and factors associated with any phenomenon are influenced by sociocultural context and vary from country to country, it is necessary to use a questionnaire designed based on the experiences and concepts expressed by the individuals living in the same context. With regard to the lack of a context-specific instrument for measuring stressors in open-heart surgery patients in Iran, the present study was conducted to develop an inventory measuring stressors among these patients and evaluate its psychometric properties. This study was conducted in two phases, one of which included item generation and tool design and the other one involved item reduction and psychometric evaluation. This qualitative study was performed through in-depth, individual interviewing with 21 individuals, including 14 patients and seven therapists, using conventional content analysis. The research environment was the open-heart surgery wards of two government hospitals in Ahvaz, southern Iran. The study was performed from May 2016 to March 2017. The inclusion criteria were: (1) the first experience of undergoing open-heart surgery, (2) a minimum age of 18 years, (3) consciousness, and (4) willingness to retell experiences. On the other hand, the exclusion criterion was withdrawal from study participation. Sampling was performed using the purposive sampling technique and continued until data saturation (14). The duration of the interview varied between 20 and 90 min. Data analysis was carried out following Graneheim and Lundman (15). The tool items were extracted from the findings of a qualitative study (an inductive approach) and review of the literature (e.g., ICUESS and RCSSS; a deductive approach). Subsequently, the initial design of the instrument was performed, and a pool of items was formed. Ultimately, the research team refined the tool to prepare it for the next stage (i.e., psychometric evaluation). The face validity of the tool was evaluated both quantitatively and qualitatively. The assessment of the qualitative face validity was accomplished through face-to-face interviews with 10 open-heart surgery patients. In the interviews, the patients were asked to read the items loudly, explain the meaning of each item, and specify the inappropriate or vague phrases for correction (16). Accordingly, some of the items were modified and revised based on the patient’s view. The quantitative face validity was performed to determine the importance of each item. To this end, the instrument was provided to another group of open-heart surgery patients (n = 10), and they were asked to give a score of 1 - 5 to each item in terms of their importance. Subsequently, the item impact was calculated by multiplying the frequency (i.e., the percentage of the people giving the scores of 4 and 5 to the item) by the mean importance score of each item. The item impact of ≥ 1.5 was indicative of the appropriateness of the item (17). The qualitative and quantitative content validities of the inventory were investigated using a panel of 10 experts, including two cardiac surgery clinical nurses, one anesthesiologist, one heart surgeon, five faculty members of psychology and nursing, and one tool development specialist. To this aim, the experts were asked to rate the content validity of each item using a three-point scale entailing “The phrase is necessary”, “The phrase is useful, but not necessary”, and “The phrase is not necessary”. Based on the Lawshe table, when the number of experts is 10, the minimum acceptable level for content validity ratio is 0.62 (18). To assess the content validity index (CVI), the panel of experts was asked to rate each item on a four-point Likert scale (i.e., irrelevant, partly relevant, relevant, and completely relevant). Then, the number of experts who selected the last two answers was divided by the total number of experts (19, 20). Subsequently, the modified Cohen’s kappa coefficient was calculated. The modified Kappa coefficient of > 0.74 was considered the minimum value for keeping an item (21). In addition, the scale-level CVI was calculated by averaging the item-level CVIs; in this regard, a value of 0.9 was considered acceptable (22). Finally, a pilot study was conducted on patients with open-heart surgery (n = 50) for item analysis. At this phase, the Cronbach’s alpha coefficient and loop method were estimated by investigating the inter-item and item-total correlations. In this study, the construct validity was evaluated using exploratory factor analysis and Multitrait-Monomethod approach (19). Sampling was performed through the convenience sampling technique. The minimum sample size for each item was between 5 and 10 people; therefore, a total number of 360 cases were enrolled in the study. The study population was selected from two public hospitals affiliated to the Universities of Medical Sciences of Tehran and Ahwaz, Iran. Finally, 360 inventories were completed and analyzed from August 2017 to February 2018. After data collection, the data were checked in terms of the fulfillment of factor analysis assumptions. To this end, the Kaiser-Meyer-Olkin (KMO) test was performed to determine the adequacy of the sample size. In addition, Bartlett’s test was run to check the correlation matrix. The KMO values of 0.7 - 0.8 signify that sampling is moderately adequate, while a value of ≥ 0.9 is indicative of excellent sampling adequacy (20). The extraction of latent factors was accomplished using principal axis factoring and Varimax rotation. For the determination of the convergent validity through Multitrait-Monomethod approach, the correlation of the scores of the five factors (i.e., subscales) with the total score of the questionnaire was measured. Furthermore, the assessment of the divergent validity was performed by the calculation of the correlation between the five factors of the inventory. Since the five factors are supposedly distinct structures, they should not have a high correlation; accordingly, a correlation of less than 0.7 is considered appropriate (23). Confirmatory factor analysis was also performed to confirm the factorial structure, determine the item-factor relationship, and evaluate the goodness of fit (24). The reliability of the inventory was determined using internal consistency and stability. To examine internal consistency, the Cronbach’s alpha coefficient was employed. A Cronbach’s alpha coefficient of > 0.7 was considered as indicating a satisfactory internal consistency. Stability testing was carried out through the test-retest method. To this end, the inventory was completed twice by 50 patients with an interval of two weeks. Then, the scores of the two stages were compared using the intra-lass correlation coefficient (ICC) test. An ICC of ≥ 0.8 represents a satisfactory level of stability (25). The floor and ceiling effects were also calculated in this study. These effects are assumed to exist when more than 15% of the respondents obtained the highest or lowest achievable score (18). The Kolmogorov-Smirnov test was used to evaluate the normality of the data. Data analysis was performed in AMOS and IBM SPSS Statistics for Windows, version 24.0 (IBM Corp., Armork, N.Y., USA) using descriptive statistics, exploratory factor analysis, variance analysis, independent t-test, internal consistency coefficient, Cronbach’s alpha coefficient, Friedman test, and confirmatory factor analysis. The study was approved by the Ethics Committee of Jundishapur University of Medical Sciences in Ahvaz, Iran (IR.AJUMS.REC.2016.386). Research approval was obtained from the university and hospitals under investigation prior to data collection. Participation in the study was based on the principle of independence and willingness to partake in the interview. Furthermore, informed consent was obtained from all participants. Additionally, the participants were ensured about the anonymity and confidentiality of their information. After the qualitative analysis of individual interviews, 81 items were generated based on the participants’ views. A set of 17 items was also added through the review of the related literature. Therefore, the primary pool consisted of 98 items. After the initial refinement of the items by the research team, the repetitive items were removed, and the ones with overlapping concepts were merged. Finally, a pool containing 88 items was prepared for psychometric evaluation. In the face validity investigation, improper and ambiguous phrases were corrected. Furthermore, all items had the impact value of > 1.5 (range: 3.6 - 5). During the evaluation of the qualitative content validity of the inventory, the written structure of some items was modifies based on the experts’ views. In this step, five items were removed due to having a CVR of < 0.62. All 83 remaining items had an acceptable modified Kappa coefficient. The scale-level CVI was obtained as 0.92, which is indicative of highly desirable content validity. Then, the item analysis was performed with a sample size of 50 people, and 11 items were merged due to having a high correlation with other items. Finally, the inventory was prepared for validation with 72 items rated on a five-point Likert scale ranging from very much to never. The majority of the participants were male (69.4%) and married (58.8%) with the mean age of 54 ± 12.03 years. Based on the results, 71.3% of the patients had undergone coronary artery bypass surgery. In this research, exploratory factor analysis was performed using principal axis factoring and Varimax rotation. The KMO statistic was estimated at 0.921, indicating the adequacy of the sample size for factor analysis. The Bartlett’s test showed a significant relationship between the items (χ2 = 18269.9, P < 0.001), which is suggestive of the fitness of the model for factor analysis. After performing this test and ensuring the factorial structure of the items, to determine the number of factors, they were extracted using Varimax rotation (eigenvalues of > 1). The first to fifth latent factors had the eigenvalues of 8.16, 7.45, 7.41, 6.68, and 6.59, respectively. The minimum factor loading for keeping an item was considered as 0.4. In this stage, variables with high correlation with each other were categorized into one class or factor. Based on the results, 22 items were removed from the inventory because they did not have the minimal factor loading. 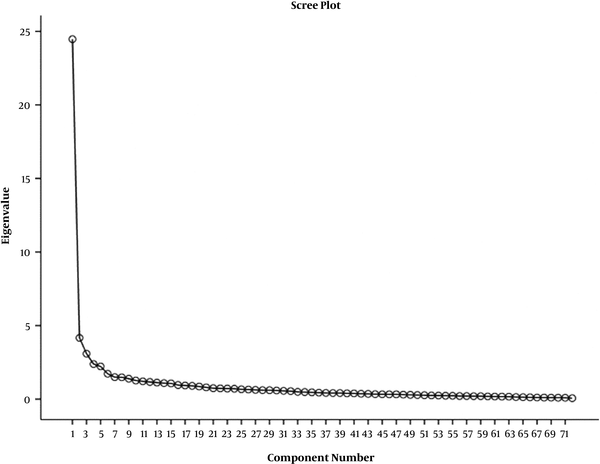 The scree plot showed that the five factors had the required adequacy to explain the factorial construct validity of the Cardiac Surgery Stressor Inventory (Figure 1). The extracted factors explained 50.451% of the total variance. The variances explained by the first to fifth factors after rotation were obtained as 11.34%, 10.35%, 10.3%, 9.28%, and 9.16%, respectively. The factors were named according to the content of the items. The first (12 items), second (13 items), third (7 items), fourth (8 items), and fifth (10 items) factors were respectively named as “stressors in the intensive care unit”, “stressors related to the fear of uncertain future”, “internal stressors”, “stressors related to treatment team and facilities”, and “preoperative stressors”. Table 1 presents the five factors, along with the items, the factor loading of each item, the percentage of variance, and the eigenvalues of each factor. All indicators obtained from confirmatory factor analysis showed acceptable goodness of fit for each factor and model (Table 2). Figure 2 displays the path diagram of the confirmatory factor analysis of the inventory. Abbreviations: CFI, comparative fit index; IFI, incremental fit index; NFI, normed fit index; NNFI, non-normed fit index; RMSEA, root mean square error of approximation; χ2/df, ratio of χ2 to degrees of freedom. Figure 2. The path diagram of confirmatory factor analysis of the inventory. Fit indices of the Cardiac Surgery Stressor Inventory were χ2 = 3809.80, χ2 /df = 3.41, Non-Normed Fit Index (NNFI) = 0.94, Root Mean Square Error of Approximation (RMSEA) = 0.08 (90% CI), Comparative Fit Index (CFI) = 0.95, Normed Fit Index (NFI) = 0.93, Incremental Fit Index (IFI) = 0.95 that represented an adequate-to-good fit to the data. The mean values of the five dimensions of the inventory included 30.61 ± 23.83 for stressors in the intensive care unit, 35.33 ± 26.38 for stressors related to the fear of uncertain future, 30.62 ± 26.20 for internal stressors, 15.75 ± 21.15 for stressors related to treatment team and facilities, and 22.81 ± 22.24 for preoperative stressors. In addition, the total mean value of the inventory was 27.85 ± 19.75. This inventory is scored using a linear method. The minimum and maximum scores are 0 and 100, respectively; accordingly, a higher score is indicative of a higher level of stress. Scores of the stressors were determined based on the demographic characteristics of the participants (Table 3). Additionally, the ceiling and floor effects of the instrument were determined by calculating the percentage of the subjects obtaining the highest and lowest scores (i.e., 100 and 0, respectively). None of the participants scored at the floor or the ceiling of the inventory. The correlation coefficient of each of the five factors with the other four factors was less than 0.7. Therefore, the divergent validity of the inventory was confirmed. Furthermore, the Pearson correlation test showed a significant direct correlation between the score of each of the five factors and the total score of the inventory (r = 0.72 - 0.87); as a result, the convergent validity was also approved (Table 4). In this research, the effort was made to minimize the unanswered items through obtaining patients’ consent to participate in the study and distributing the inventories at the proper time. In addition, the researcher checked the inventories when collecting to ensure that they had been fully answered. One of the best strategies to control the forgotten data is to replace them with the mean score (24); therefore, this method was applied in the present study. The present inventory had a Cronbach’s alpha coefficient of 0.87, which is indicative of a desirable level of internal consistency. The ICC between the test and retest scores was obtained as 0.94 with a time interval of two weeks (Table 5). The present study was conducted to design and psychometrically evaluate the Cardiac Surgery Stressors Inventory. The final version of this tool includes 50 items in five domains, including “stressors in the intensive care unit”, “stressors related to the fear of uncertain future”, “internal stressors”, “stressors related to treatment team and facilities”, and “preoperative stressors”. The results revealed that this instrument had acceptable reliability and validity. The first domain entailing 12 items is related to the stressors in the ICU, which has more items compared to those of other stressor assessment questionnaires (8, 11). The patients had negative experiences regarding the perceived stressors in the ICU. These experiences mostly included pain, insomnia, inconvenience, inactivity or excessive mobility, noise, thirst, headache, the gastrostomy tube, medical equipment, medical activities, aspiration, and odynophagia. Patients generally reported intubation as a negative experience. Similarly, devices such as oxygen masks, pulse oximeter probes, and nasogastric tube caused inconvenience for the patients (26). The second domain of the inventory consisting of 13 items focuses on the stressors caused by the fear of uncertain future. This domain has not been considered independently in any of the available questionnaires (8, 11, 27). Some of the participants in this study were optimistic about the surgical outcome and their future; accordingly, they were confident that they would obtain a full recovery. On the other hand, a number of participants did not have a positive attitude toward this issue and were worried about the future and surgical outcome. They feared that the outcome would not be satisfactory. This is consistent with the results of a study performed by Zinchenko et al. (28) showing an association between attitude and surgical outcomes. In the mentioned study, a number of patients who had a pessimistic attitude and believed that heart surgery would not be helpful had a long and complicated postoperative period. On the other hand, the patients with optimistic attitudes, despite having no difference with the previous group in terms of physical condition, had a shorter hospital stay without any complications. This study showed that the psychological support of open-heart surgery patients contributes to the formation of an appropriate and optimistic attitude toward the outcome of cardiac surgery. In addition, the psychologist’s awareness of patient’s attitude towards the outcome of heart surgery can facilitate the identification of specific objectives (28). Accordingly, the implementation of targeted interventions assists the reduction of the pessimistic attitude toward cardiac surgery, thereby shortening the hospital stay and reducing postoperative complications. The third domain with seven items covered internal stressors. The participants were upset and worried about their isolation, personal hygiene issues, hijab, and inappropriate dressing. However, this domain has not been included in any of the stress assessment questionnaires as an independent subscale (8, 11, 27). The patients were concerned about dirty clothing, body impurity, and the presence of contaminated discharge on the body, and worried that this contamination would infect their surgical wounds. In the present study, the participants expected from the nursing personnel of the cardiac surgery ward to observe the hygiene and provide a healthy and non-infectious environment. The patients felt guilty upon the non-fulfillment of their religious needs and constantly seek God’s blessing. Accordingly, our patients got upset about the impurity of the clothes and body, lack of a complete hijab, and not saying prayers, which negatively affected their tranquility. Based on the evidence, religious practices are effective in reducing complications and shortening hospital stay in patients undergoing coronary artery bypass grafting (29). The fourth domain consisted of eight items regarding the stressors related to the treatment team and facilities. The provision of care without previous justification, forgetfulness, care delay, and lack of prompt and timely presence of the nurse were very unpleasant and disturbing for patients. In the current study, the patients sought relaxation and attention from nurses. Patients’ dissatisfaction with hospital care occurs when they realize that nurses are not available enough (30). The patients believed that cardiac surgery is very different from other surgeries. Consequently, these patients should be given special attention by the staff and treatment team. Timely attendance, proper training, and appropriate behavior of the treatment team are among the essential factors to give the patients a sense of security. Furthermore, the patients felt insecure in case the nurses did not visit and monitor them frequently. Nursing visits are of particular importance to patients. The physical presence of the nurses provides the patients with more tranquility, compared to the mere delivery of care to the patients. The last domain (i.e., preoperative stressors) with ten items had the maximum internal consistency (α = 0.816). This domain has more items, compared to the intrapersonal and psychosocial domains of the other stressor assessment questionnaires (8, 11). This resulted in a more accurate evaluation of preoperative stressors. Other instruments measure preoperative stressors only with three items (8, 11). Based on our results, some interventions should target the management of stress before the surgery. Currently, there are four instruments for measuring stressors in patients (8, 10, 11, 27). However, the only applicable instrument is the RCSSS (11). Nonetheless, the stressor tools such as hospital stress rating scale, ICUESS, CSSS, and RCSSS have not been subject to exploratory factor analysis. In addition, there is no report regarding the reliability of the subscales of these instruments, with the exception of CSSS. The subscales of CSSS had the Cronbach’s alpha coefficients of 0.87 and 0.88. Moreover, the ceiling and floor effects have not been reported for any of the existing questionnaires. In the present study, the ceiling and floor effects were below 15%, suggesting the designed inventory as a proper tool to measure stressors in open-heart surgery patients. Given the fact that the meaning, concept, and factors associated with any phenomenon are influenced by sociocultural context and they vary from country to country, it is necessary to use a questionnaire designed based on the experiences and concepts expressed by the individuals living in the same context. According to the findings, the developed 50-item Cardiac Surgery Stressor Inventory is a simple, valid, and reliable tool for the measurement of stressors in open-heart surgery patients. The inventory developed in the present study can be used in cardiac surgery wards to measure stressors and outcomes of the provided services. This questionnaire can be used by nurses to educate patients and their families about the problems of open-heart surgery with the aim of improving their postoperative recovery. This scale can be also adopted in clinical trials and descriptive studies to determine the underlying condition of open-heart surgery patients and decide on the type of interventions. One of the limitations of this study is that our developed scale cannot be generalized to other populations. Thus, it is recommended to evaluate the psychometric properties of this instrument in other cities of Iran. Another limitation of the study was that in both qualitative and psychometric analyses, the participants were over 18 years of age; therefore, this tool is not applicable to children and adolescents. Hereby, the researchers extend their gratitude to the participants and the Research Deputy of Ahvaz University of Medical Sciences, Ahvaz, Iran, for financially supporting this study. Authors' Contribution: All authors contributed to the design and writing of the paper. Conflict of Interests: There is no conflict of interest. Ethical Considerations: This study was approved by the Ethics Committee of Jundishapur University of Medical Sciences in Ahvaz, Iran (IR.AJUMS.REC.2016.386). Research approval was obtained from the university and hospitals under investigation prior to data collection. Participation in the study was based on the principle of independence and willingness to partake in the interview. Furthermore, informed consent was obtained from all participants. Additionally, the participants were ensured about the anonymity and confidentiality of their information. Funding/Support: The present study was funded by the Research Deputy of Jundishapur University of Medical Sciences. 1. Ramesh C, Nayak BS, Pai VB, Patil NT, George A, George LS, et al. Effect of preoperative education on postoperative outcomes among patients undergoing cardiac surgery: A systematic review and meta-analysis. J Perianesth Nurs. 2017;32(6):518-529 e2. doi: 10.1016/j.jopan.2016.11.011. [PubMed: 29157759]. 2. Neupane I, Arora RC, Rudolph JL. Cardiac surgery as a stressor and the response of the vulnerable older adult. Exp Gerontol. 2017;87(Pt B):168-74. doi: 10.1016/j.exger.2016.04.019. [PubMed: 27125757]. [PubMed Central: PMC5081280]. 3. Kokoszka A, Bohaterewicz B, Jeleńska K, Matuszewska A, Szymański P. Post-traumatic stress disorder among patients waiting for cardiac surgery. Arch Psychiat Psychother. 2018;20(2):20-5. doi: 10.12740/app/91001. 4. Shafipour V, Mohammadi E, Ahmadi F. Experiences of open heart surgery patients from admission to discharge: A qualitative study. Iran J Crit Care Nurs. 2013;6(1):1-10. 5. Bettex D, Rudiger A. Length of ICU stay after cardiac surgery: Too long or too short? J Cardiothorac Vasc Anesth. 2018;32(6):2692-3. doi: 10.1053/j.jvca.2018.05.045. [PubMed: 30523798]. 6. Abuatiq A. Patients' and health care providers' perception of stressors in the intensive care units. Dimens Crit Care Nurs. 2015;34(4):205-14. doi: 10.1097/DCC.0000000000000121. [PubMed: 26050051]. 7. Gallagher R, McKinley S. Stressors and anxiety in patients undergoing coronary artery bypass surgery. Am J Crit Care. 2007;16(3):248-57. [PubMed: 17460316]. 8. Carr JA, Powers MJ. Stressors associated with coronary bypass surgery. Nurs Res. 1986;35(4):243-6. [PubMed: 3487775]. 9. Ballard KS. 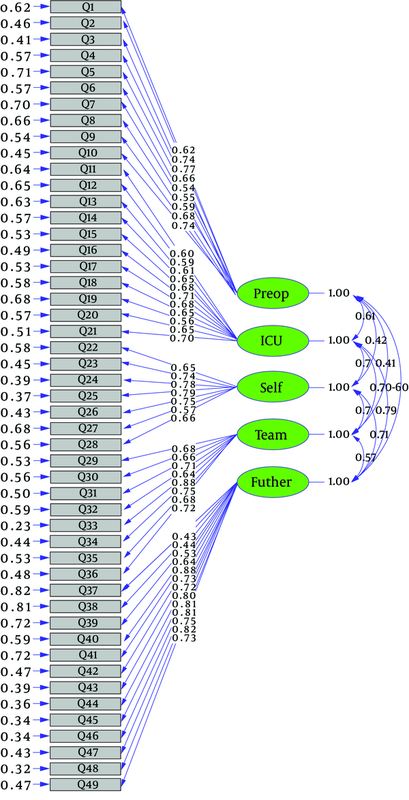 Identification of environmental stressors for patients in a surgical intensive care unit. Issues Ment Health Nurs. 1981;3(1-2):89-108. [PubMed: 6909159]. 10. Cochran J, Ganong LH. A comparison of nurses' and patients' perceptions of intensive care unit stressors. J Adv Nurs. 1989;14(12):1038-43. [PubMed: 2613957]. 11. White RM. Nurse-patient perception of stressors associated with coronary artery bypass surgery [dissertation]. Las Vegas: University of Nevada; 1998. 12. Sammons A. Culture and stress. 2018. Available from: www.psychlotron.org.uk/resources/physiological/aqa_as_stress_culturearticle. 13. Mehrad Sadr M, Hashemian SS, Khoshsima H, Akhbari S. Reliability and factor structure of social paradigm belief inventory. Iran J Psychiatry Clin Psychol. 2018;24(3):340-55. doi: 10.32598/ijpcp.24.3.340. 14. Speziale HS, Streubert HJ, Carpenter DR. Qualitative research in nursing: Advancing the humanistic imperative. Lippincott Williams & Wilkins; 2011. 15. Graneheim UH, Lundman B. Qualitative content analysis in nursing research: concepts, procedures and measures to achieve trustworthiness. Nurse Educ Today. 2004;24(2):105-12. doi: 10.1016/j.nedt.2003.10.001. [PubMed: 14769454]. 16. Mohammadbeigi A, Mohammadsalehi N, Aligol M. [Validity and reliability of the instruments and types of measurments in health applied researches]. J Rafsanjan Univ Med Sci. 2015;13(12):1153-70. Persian. 17. Delshad MH, Hidarnia A, Niknam S. [Psychometric measure continuous variables preventive behaviors of hepatitis B virus infection in health care workers]. J Mazandaran Univ Med Sci. 2014;23(109):71-82. Persian. 18. Ebadi A, Zarshenas L, Rakhshan M, Zareiyan A, Sharifnia S, Mojahedi M. [Principles of scale development in health science]. Tehran: Jame-e-Negar; 2017. Persian. 19. Waltz CF, Strickland OL, Lenz ER. Measurement in nursing and health research. Springer Publishing Company; 2010. 20. Sharif Nia H, Ebadi A, Lehto RH, Mousavi B, Peyrovi H, Chan YH. Reliability and validity of the persian version of templer death anxiety scale-extended in veterans of Iran-Iraq warfare. Iran J Psychiatry Behav Sci. 2014;8(4):29-37. [PubMed: 25798171]. [PubMed Central: PMC4364474]. 21. Polit DF, Beck CT, Owen SV. Is the CVI an acceptable indicator of content validity? Appraisal and recommendations. Res Nurs Health. 2007;30(4):459-67. doi: 10.1002/nur.20199. [PubMed: 17654487]. 22. Polit DF, Beck CT. The content validity index: are you sure you know what's being reported? Critique and recommendations. Res Nurs Health. 2006;29(5):489-97. doi: 10.1002/nur.20147. [PubMed: 16977646]. 23. Hallinger P, Wang WC, Chen CW, Liare D. Assessing instructional leadership with the principal instructional management rating scale. Springer International Publishing; 2015. 24. Pahlevan Sharif S, Sharif Nia H. [Structural equation modeling with AMOS]. Bisheh; 2018. Persian. 25. Reneman MF, Dijkstra A, Geertzen JH, Dijkstra PU. Psychometric properties of chronic pain acceptance questionnaires: A systematic review. Eur J Pain. 2010;14(5):457-65. doi: 10.1016/j.ejpain.2009.08.003. [PubMed: 19819172]. 26. Topçu S, Ecevit Alpar Ş, Gülseven B, Kebapçı A. Patient experiences in intensive care units: A systematic review. Patient Experience J. 2017;4(3):115-27. 27. Volicer BJ, Bohannon MW. A hospital stress rating scale. Nurs Res. 1975;24(5):352-9. [PubMed: 1041618]. 28. Zinchenko YP, Bokeria LA, Kiseleva MG. Psychological factors and outcomes of coronary surgery. Psychol Russia. 2013;6(4):160. doi: 10.11621/pir.2013.0414. 29. Gomes ET, Espinha DCM, da Silva Bezerra SMM. Religion and belief in God in the preoperative period of cardiac surgery: An exploratory study. Online Brazil J Nurs. 2015;14(3):273-84. 30. Aiken LH, Sloane DM, Ball J, Bruyneel L, Rafferty AM, Griffiths P. Patient satisfaction with hospital care and nurses in England: An observational study. BMJ Open. 2018;8(1). e019189. doi: 10.1136/bmjopen-2017-019189. [PubMed: 29326193]. [PubMed Central: PMC5781188].